Another vessel that had suffered delays because of the thick fog upriver was the Gibraltar-flagged tanker STEN FRIGG, seen here passing McInroy's Point as she sailed on Tuesday afternoon. 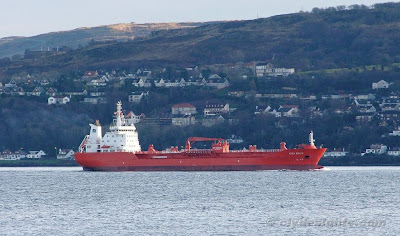 STEN FRIGG had initally anchored in Brodick Bay on Friday afternoon when she arrived from Mongstad, but later moved to the 'Alpha' anchorage off Greenock. She remained there until daylight on Monday, heading upriver once CURZOLA had cleared the berth in Rothesay Dock. STEN FRIGG was built by the Jiangnan shipyard in China and completed at the beginning of this year. Owned by Stenersen, she is 144.1 metres overall, and had a deadweight of 16,587 tonnes. On leaving the Clyde, she was returning to Mongstad.